I'd have to say my favorite glove of the week is a turn of the century Reach first baseman's model glove. This glove landed more than $430. I'm not sure if this would be a pita pocket glove or not, regardless, a great glove. A stunningly mint glove was the Spalding red, white, and blue Don Kessinger Spalding 42-3225 Professional Model. The glove web resembles the Rawlings Bellows Web of the same era. The glove sold for $126, and unlike many gloves with the red, white, and blue coloring, the blue remained vibrant, not fading to an aqua-green color. Although this is a gorgeous glove I was very surprised at the final price. 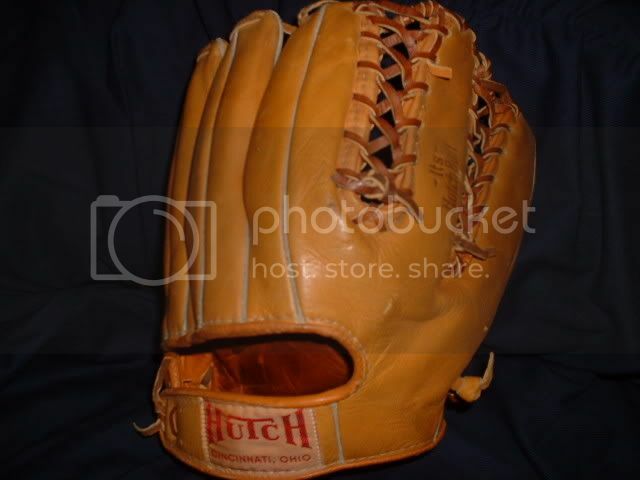 I have to agree on the Hutch Big 6 model, what a beautiful glove. As far as the price, that is tough to say. Although there is no player featured on the box, it is matching and in terrific shape. Personally, I've never really sought any boxes to go with the glove but there is certainly a market. I can attest to the quality of the glove. I have an Early Wynn Big 6 model that is nearly identical. It is positively one of my favorites. The leather is beautiful, great lacing, and the Hutch patch really stands out against the light colored leather.